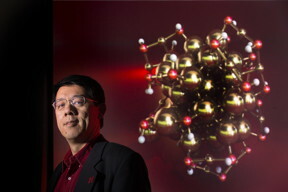 Xiao Cheng Zeng, chemistry professor at the University of Nebraska-Lincoln, is shown with a model of a gold nano-cluster. Arranging gold, atomic staples and electron volts, chemists have drafted new nanoscale blueprints for low-energy structure capable of housing pharmaceuticals and oxygen atoms. Led by University of Nebraska-Lincoln chemistry professor Xiao Cheng Zeng, and former UNL visiting professor Yi Gao, new research has revealed four atomic arrangements of a gold nanoparticle cluster. The arrangements exhibit much lower potential energy and greater stability than a standard-setting configuration reported last year by a Nobel Prize-winning team from Stanford University. The researchers reported their findings in the April 24 edition of Science Advances, an online journal from the American Association for the Advancement of Science. Zeng and Gao co-authored the study with Wen Wu Xu, who works with Gao at the Shanghai Institute of Applied Physics. The team, which received support from the U.S. Army Research Laboratory and UNL's Nebraska Center for Energy Sciences Research, performed most of its computational analyses through the Holland Computing Center.